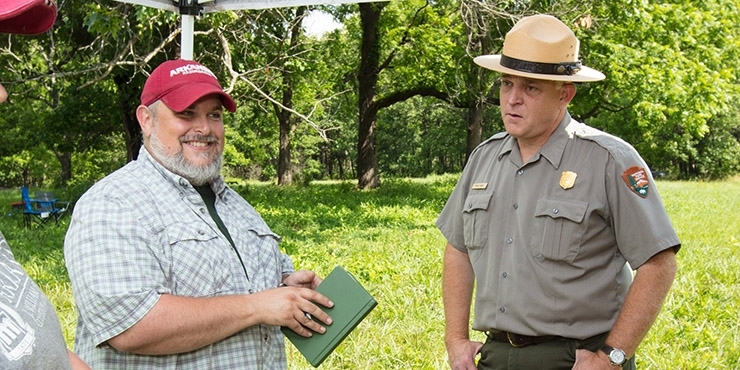 Jamie Brandon, station archeologist at Fayetteville, talks with Kevin Eads, superintendent of the Pea Ridge National Military Park during archeological work at the Civil War site. FAYETTEVILLE, Ark. – At Leetown, a 19th-century hamlet inside Pea Ridge National Military Park, wounded soldiers were treated in most, if not all, of the community's buildings, none of which stand today. And 9,000 years ago, even before the Caddo and Osage people, other indigenous groups of people may have lived in Arkansas' bluff shelters. Jamie Brandon, Fayetteville station archeologist with the Arkansas Archeological Survey and research associate professor in the Department of Anthropology int he J. William Fulbright College of Arts and Sciences at the University of Arkansas, discusses importance of these bluff shelters and the hamlet that served as a field hospital for the first engagement of the Battle of Pea Ridge in a new edition of Short Talks From the Hill, a podcast from the University of Arkansas. Jamie Brandon, right, leads a talk about bluff shelters in the Ozarks. Students measure the location of artifacts at Lee Town. Another student shovels a thin layer of dirt during the dig at Lee Town. "Shortly after the battle this town sort of disappears to history," Brandon says in the podcast. The National Park Service has asked Brandon and the Survey to help "find" the town, so it can offer interpretation as it does at the popular Elkhorn Tavern, which is closer to the battle's second engagement. "The park is trying to interpret the landscape and bring the landscape back to where it was," Brandon says. "And we don't have any historical documentary agreement on how many buildings make up Leetown or where those buildings were or what those buildings functioned as. 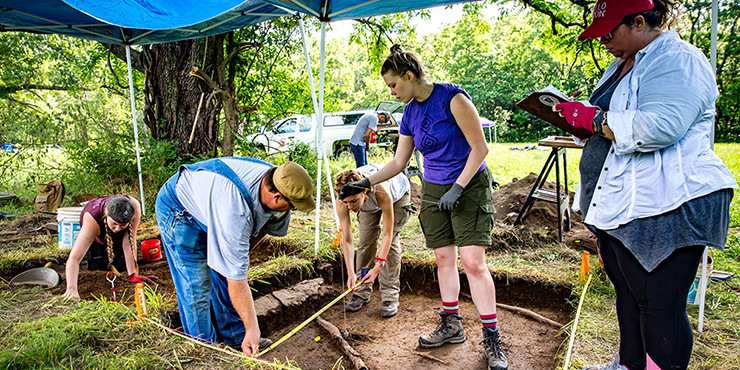 And so this is one of the ways that archaeology can easily contribute beyond the historical documentary record." 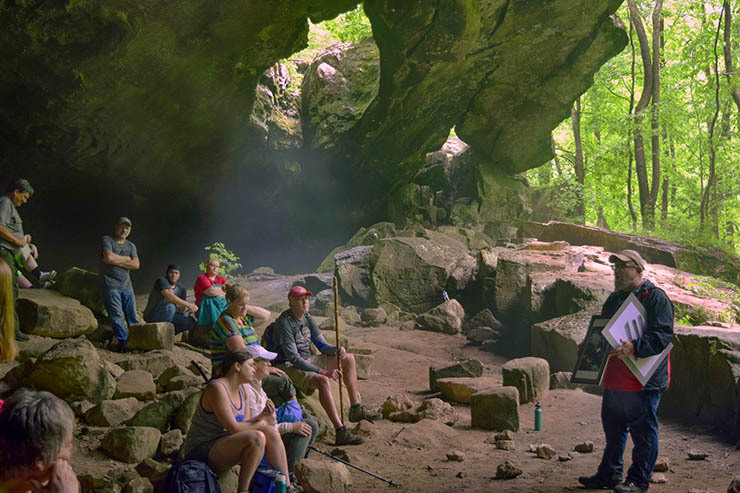 To listen to Brandon talk more about Leetown and Ozark bluff shelters, as well as how the Arkansas Archeological Survey serves the state, go to ResearchFrontiers.uark.edu, the home of research news at the University of Arkansas. Listeners can also find Short Talks From the Hill podcasts under the "Local & Podcast" link at KUAF.com. 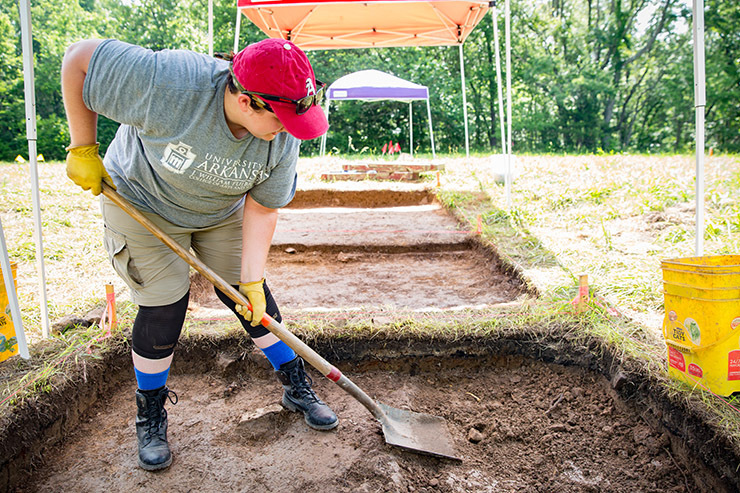 A related story about the Leetown archeological dig and the Arkansas Archeological Field School can be found at Research Frontiers.